BOOKTRYST: Is the Bibliophilist a Man, a Woman, or Gertrude Stein? Is the Bibliophilist a Man, a Woman, or Gertrude Stein? 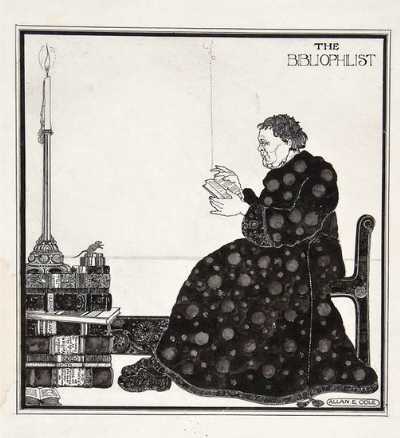 The Bibliophilist by Alan E. Odle, c. 1910. There The Bibliophilist sits, a stout, androgynous figure in a voluminous dressing gown and slippers, reading and smoking by the light of a candle resting atop a pile of books including volumes by Balzac, Swift, Dante, Vuillier, Goya, and Richard Payne Knight. Here The Biblioiphilist appears on Whatman wove paper watermarked 1907, in pen and black ink by Allan E. Odle (1888-1948), c. 1910, in the style of Aubrey Beardsley. Of Odle, little is known. He was married to novelist Dorothy Richardson (1873-1957), fifteen years his senior. A book illustrator, he designed the dust jacket for the Ordinary Edition of James Hanley's Ebb and Flow (London: John Lane at the Bodleyhead, 1932), and other Hanley novels for Lane, and provided illustrations to Candide (G. Routledge, 1922), Richardson's Backwater (1916), and a U.K. edition of Twain's salute to scatology and Elizabethan manners, 1601 a Tudor Fireside Conversation (London: Printed for Subscribers only and to be sold at ye beare Backside-in-Maiden Lane, 1936), amongst others. He was known for his grotesque style, and was connected to the surrealists, as was Richardson's work favorably compared to the key surrealist/stream of consciousness modern novelists, particularly Gertrude Stein. Did Alan Odle, a young artist in his early twenties very much into modernism, cross paths with Gertrude Stein who, from 1903-1912, lived in Paris with her brother, Leo? Perhaps while Odle was an art student in Paris and she a modernist art critic making her mark? Did she sit for him and then reject the portrait as a bit too grotesque? Alternatively, is this an anonymous impression of her by Odle? Or is the similarity between the figure in The Bibliophilist and Gertrude Stein simply a delightful coincidence? Bloomsbury-London is offering The Bibliophilist at their Books, Manuscripts, Maps, and Works on Paper sale, December 15, 2011 without identifying the figure. The estimate is £150-£200, the same as when Bloomsbury previously offered this so far homeless drawing in which Odle has, to all appearances, captured Gertrude Stein in what might be an unrecorded Stein portrait. 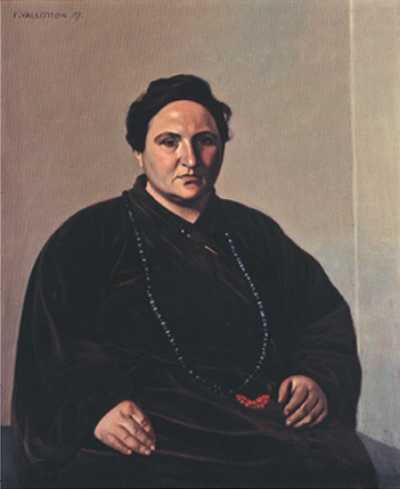 Portrait of Gertrude Stein by Félix Valloton, 1907. ODLE, Allan E. The Bibliophilist. N.p., n.d. [c. 1910]. 325 x 310mm., signed lower right, titled upper right, a marginal dampstain centre left. Image courtesy of Bloomsbury Auctions, with our thanks.